Description: By the late 1930s these houses had long been forgotten as Wright's work. 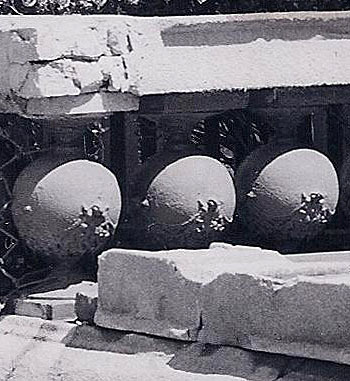 They were rediscovered in 1940 when Grant Carpenter Manson "happened upon them while driving along Calumet Avenue looking for some early Adler and Sullivan buildings". According to William Storrer, Robert W. Roloson purchased four rowhouses and commissioned Wright to remodel them in 1894. This was Wright’s 26th project (Storrer 026). Manson indicates that Roloson commissioned Wright to "design the houses... on property which he wanted to improve. The idea of erecting identical row houses..." Henry-Russell Hitchcock, "In The Nature of Material" Page 108, says they were "Remodeled as apartments". 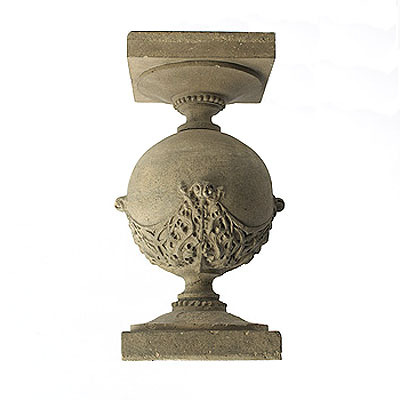 This baluster is very similar to the design used in the Nathan G. Moore Residence (1895). Wright often used identical or similar forms in commissions of approximately the same date. 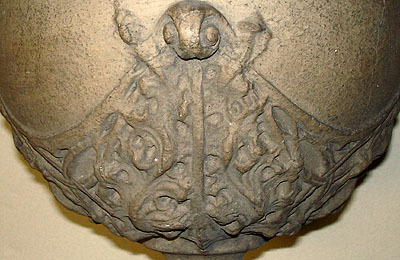 An example is the same wall sconce used in the Little Residence, Peoria (1902) and in the Dana Residence (1902). 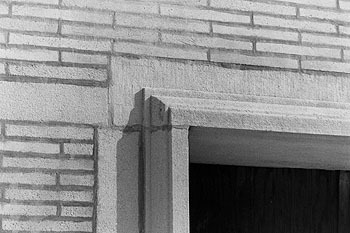 In 1981, fire gutted the interior and the structure was neglected. 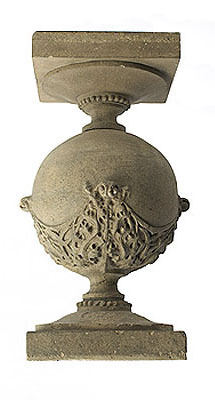 Under the assumption that the building would be torn down, the building’s ornamental items were scavenged. "Robert W. Roloson Houses" was published in 1979. 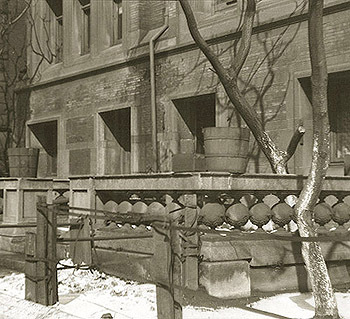 Grant Carpenter Manson writes extensively about the Roloson Rowhouses in “Frank Lloyd Wright to 1910", 1958. Pp 69-71. 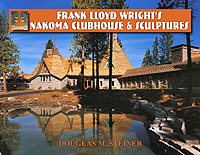 Robin Langley Sommer also wrights about it in "Frank Lloyd Wright, American Architect for the Twentieth Century" 1993, Pp 36-37. 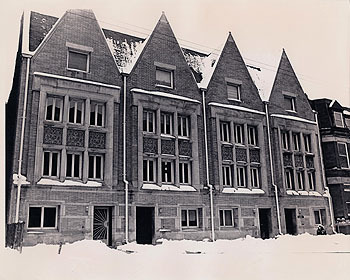 Roloson Rowhouses in 1930s. Gilman Lane photographer. 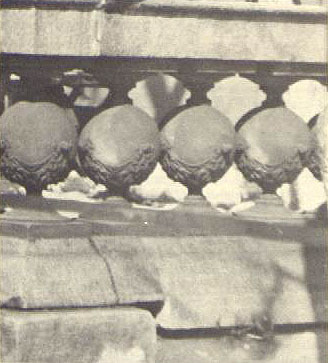 Original balustrade 1940. Grant Manson photographer. 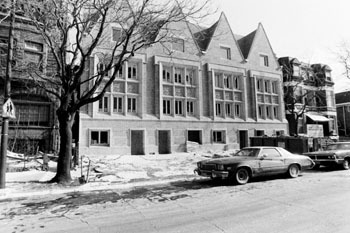 Roloson Rowhouses as they appeared in the late 1987 (left). Bob Thall photographer. 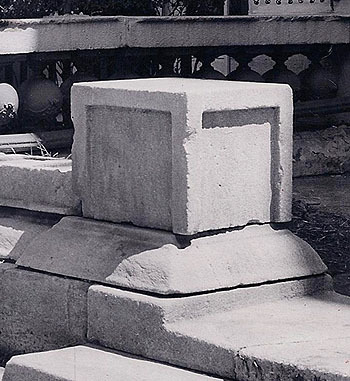 Nathan G. Moore balustrade (left). 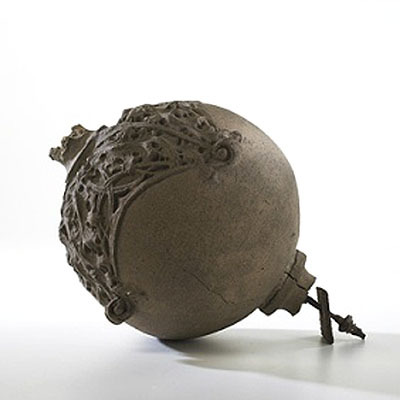 Comparing the Roloson on the right with the Moore on the left: A) Orb is about 75% smaller than Moore. B) Neck has pedestal and is much taller than Moore. C) Moore has horizontal center line. 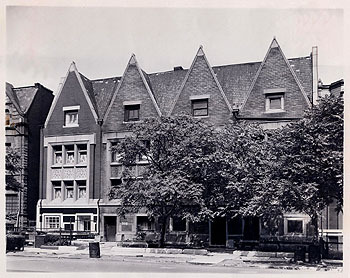 Title: Roloson Rowhouses (1894 S.026) 1961. Description: Photographed on June 26, 1961 by Chicago Daily News photographer Robert Stiewe. Stamped on verso: "Daily News. Dec 13, 1961." Caption pasted on verso: "Little-known landmarks, the ‘Roloson houses’ at 3213-19 S. Calumet, were built by Frank Lloyd Wright in the 1890s. For many years they were lost to architectural memory. Today they stand in the midst of a bad slum marked almost entirely for clearance. Will they too be cleared? Nobody knows." Acquired from the archives of the Chicago Daily News. For more informamtion see our Wright Study on Robert W. Roloson Rowhouses. Size: A) Original 10 x 8 B&W print. B) One original 4x5 B&W negative C) Second original 4x5 B&W negative and one High Res 46 x 36" B&W photograph. 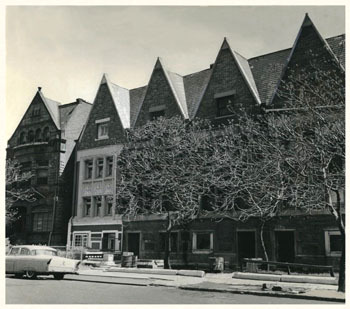 Title: Roloson Rowhouses (1894 S.026) 1963. 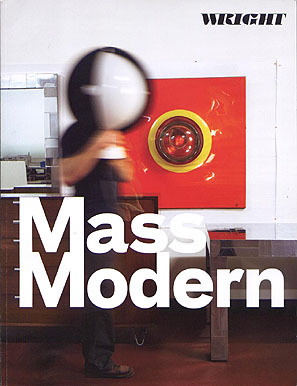 Description: Stamped on verso: "Sun Times. May 12, 1963." Clipping pasted on verso: "This love of music was an early sign that Chicago had a soul." - Frank Lloyd Wright. On the South Side along Calumet Av., their backs facing the steel-and-glass high-rise apartment of Prairie Shores, sit our unimposing row houses. Of an English Tudor design, they appear to be little different from many of their neighbors that have gone the way of the wrecking ball. But different hey are. 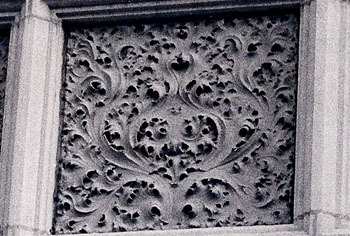 In fact, they are historically and architecturally unique. 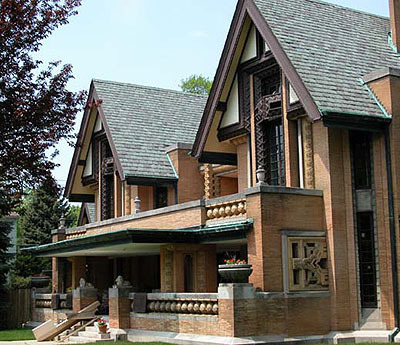 Located at 3213-15-17-19, they are the Roloson Houses, an early creation of the most famous and influential architect of the last half-century - Frank Lloyd Wright. Little is known about the houses. They - unlike almost all of the other Wright structures - have received almost no public notice. Now they may be swept away by the mighty bulldozer of urban renewal. No plans for their destruction have been made by the urban renewal people. But they’re not making any promises, and as o the future, well... What exactly is the importance of the row houses? Today is the sum total of the past. Let us take a look. In 1894, Wright, an aggressive architect in his early 20s, received a commission by one Robert Roloson to build some income-producing buildings on he South Side. Wright apparently wasn’t overenthusiastic because, once completed, he virtually erased the memory of the houses from his mind. Article by Alver Carlson. Acquired from the archives of the Chicago Sun Times. Size: Original 8 x 9 B&W print. Size: Original 8.25 x 9 B&W print. 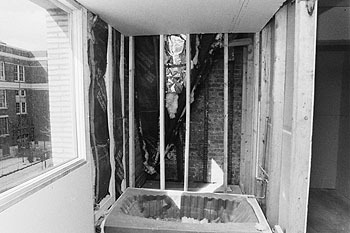 Title: Roloson Rowhouses during 1981 renovation (1894 - S.026). Description: "Four Landmark Frank Lloyd Wright Townhouses For Sale." Four landmark row houses on the Near South Side designed by Frank Lloyd Wright get a new lease on life. A suit in Housing Court once sought to demolish the Roloson houses, which were vacant for years and fell into disrepair. Parents from Douglas Elementary School across the street complained that the houses harbored packs of stray dogs that menaced children. Now the houses, listed in the National Register of Historic Places in 1977 and designated as city landmarks in 1979, are being rehabilitated by businessman James J. Hutchinson Jr. and his sister, Janice, a pediatrician. 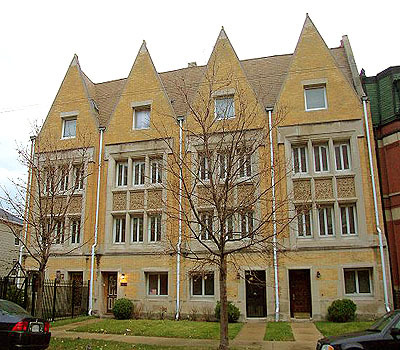 The four row houses are characterized by steep-sided triangular gables and rectangular windows divided by heavy mullions. 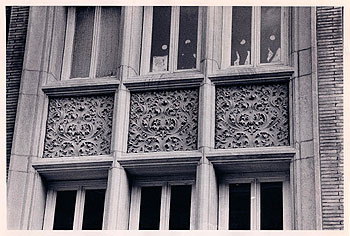 Sullivanesque terra-cotta spandrel panels separate the second and third level windows. Photographed by Gene Pesek on February 9, 1981. Reporter: Jackie Thomas. Acquired from the archives of the Chicago Sun Times. Two similar views. Size: Original 35mm B&W negative and 10 x 7 B&W print. Description: "Four Landmark Frank Lloyd Wright Townhouses For Sale." Four landmark row houses on the Near South Side designed by Frank Lloyd Wright get a new lease on life. A suit in Housing Court once sought to demolish the Roloson houses, which were vacant for years and fell into disrepair. Parents from Douglas Elementary School across the street complained that the houses harbored packs of stray dogs that menaced children. Now the houses, listed in the National Register of Historic Places in 1977 and designated as city landmarks in 1979, are being rehabilitated by businessman James J. Hutchinson Jr. and his sister, Janice, a pediatrician. 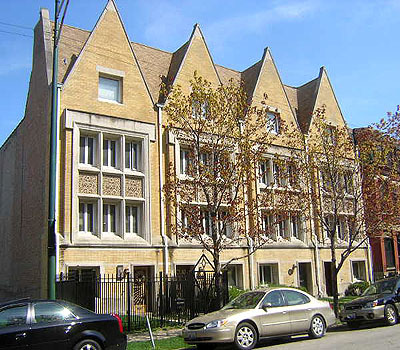 The four row houses are characterized by steep-sided triangular gables and rectangular windows divided by heavy mullions. 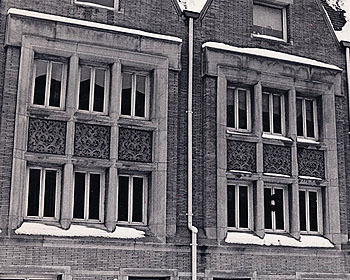 Sullivanesque terra-cotta spandrel panels separate the second and third level windows. Photographed by Gene Pesek on February 9, 1981. Reporter: Jackie Thomas. Acquired from the archives of the Chicago Sun Times. Four similar views. 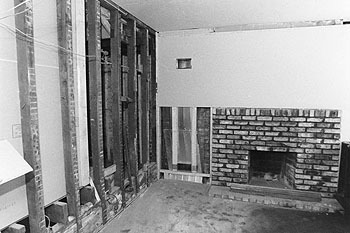 Title: Roloson Rowhouses during remodel (1894 S.026) 1981. Size: Original 35mm B&W Negative #1A-5A and six 10 x 7 B&W photographs. Description: "Four Landmark Frank Lloyd Wright Townhouses For Sale." Four landmark row houses on the Near South Side designed by Frank Lloyd Wright get a new lease on life. 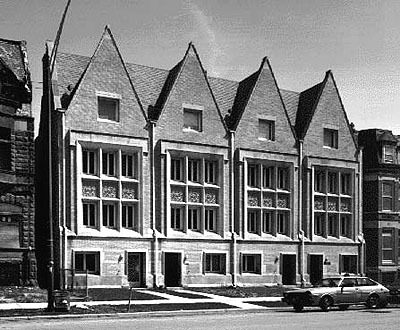 The four row houses are characterized by steep-sided triangular gables and rectangular windows divided by heavy mullions. Photographed by Gene Pesek on February 9, 1981. Reporter: Jackie Thomas. Acquired from the archives of the Chicago Sun Times. Size: Original 35mm B&W negative and 10 x 7 B&W print. Two similar views. 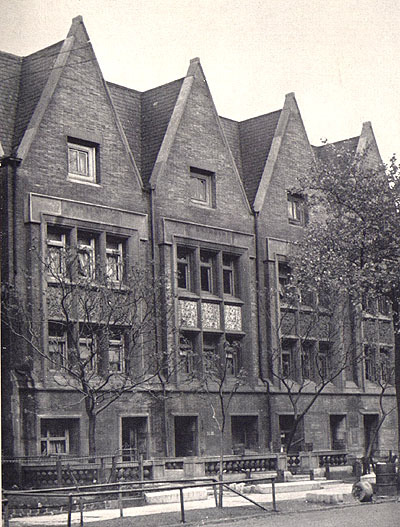 Title: Roloson Rowhouses Terra-cotta Spandrel Panels (1894 S.026) 1981. Size: Original 10 x 7 B&W print. Description: "Four Landmark Frank Lloyd Wright Townhouses For Sale." Four landmark row houses on the Near South Side designed by Frank Lloyd Wright get a new lease on life. The windows are divided by heavy mullions. 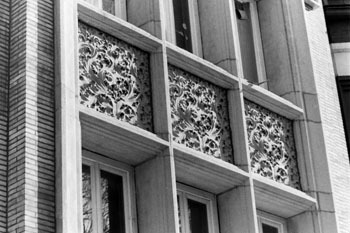 Sullivanesque terra-cotta spandrel panels separate the second and third level windows. Photographed by Gene Pesek on February 9, 1981. Reporter: Jackie Thomas. Acquired from the archives of the Chicago Sun Times. Two similar views. Description: "Four Landmark Frank Lloyd Wright Townhouses For Sale." 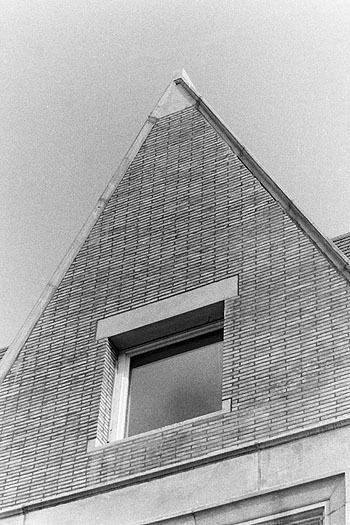 Detail of the brick and stone work surrounding the windows and doors on the first level. Photographed by Gene Pesek on February 9, 1981. Reporter: Jackie Thomas. Acquired from the archives of the Chicago Sun Times. Description: "Four Landmark Frank Lloyd Wright Townhouses For Sale." View of the front descriptive sign. 5 Bedrooms, 4 Baths, Living Room / Dining Room / Library, 4000 Sq. 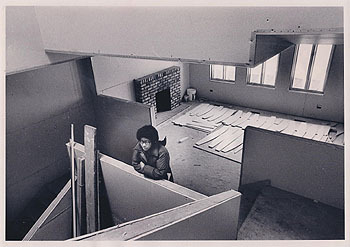 Ft of Living Space, 1 Office, 1 Study Room, 1 Family Room... Photographed by Gene Pesek on February 9, 1981. Reporter: Jackie Thomas. Acquired from the archives of the Chicago Sun Times. Two similar views. 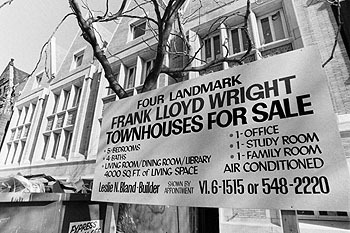 Description: "Four Landmark Frank Lloyd Wright Townhouses For Sale." View of the back and the descriptive sign. 5 Bedrooms, 4 Baths, Living Room / Dining Room / Library, 4000 Sq. 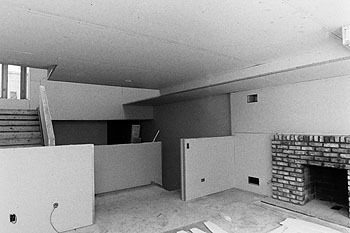 Ft of Living Space, 1 Office, 1 Study Room, 1 Family Room... Photographed by Gene Pesek on February 9, 1981. Reporter: Jackie Thomas. Acquired from the archives of the Chicago Sun Times. Four similar views. Description: "Four Landmark Frank Lloyd Wright Townhouses For Sale." Four landmark row houses on the Near South Side designed by Frank Lloyd Wright get a new lease on life. A suit in Housing Court once sought to demolish the Roloson houses, which were vacant for years and fell into disrepair. Parents from Douglas Elementary School across the street complained that the houses harbored packs of stray dogs that menaced children. 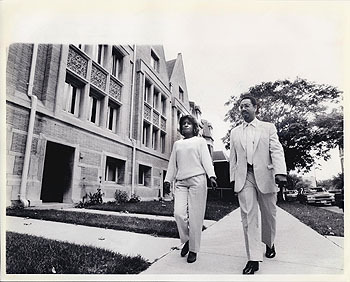 Now the houses, listed in the National Register of Historic Places in 1977 and designated as city landmarks in 1979, are being rehabilitated by businessman James J. Hutchinson Jr. and his sister, Janice, a pediatrician. 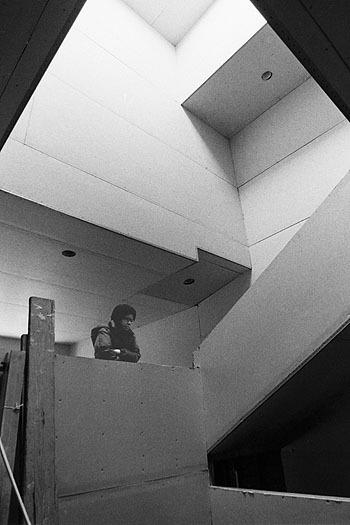 Standing in the main stairwell is Dr. Janice Hutchinson, who is renovating the landmark houses with her brother, businessman James J. Hutchinson Jr. Photographed by Gene Pesek on February 9, 1981. Reporter: Jackie Thomas. Acquired from the archives of the Chicago Sun Times. 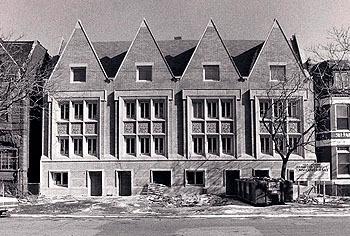 Title: Roloson Rowhouses (1894 S.026) 1981. Description: "Four Landmark Frank Lloyd Wright Townhouses For Sale." Viewed from the front of the home looking toward the back on the second level. 5 Bedrooms, 4 Baths, Living Room / Dining Room / Library, 4000 Sq. Ft of Living Space, 1 Office, 1 Study Room, 1 Family Room. Photographed by Gene Pesek on February 9, 1981. Reporter: Jackie Thomas. Acquired from the archives of the Chicago Sun Times. Description: "Four Landmark Frank Lloyd Wright Townhouses For Sale." 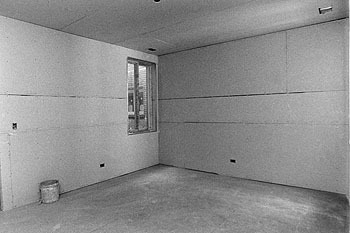 View of the "Dining Room", looking toward the back of the home on the second floor. 5 Bedrooms, 4 Baths, Living Room / Dining Room / Library, 4000 Sq. Ft of Living Space, 1 Office, 1 Study Room, 1 Family Room. Photographed by Gene Pesek on February 9, 1981. Reporter: Jackie Thomas. Acquired from the archives of the Chicago Sun Times. Description: "Four Landmark Frank Lloyd Wright Townhouses For Sale." View of the "Drawing Room" on the second floor. Evidence of removed lath and plaster visible on the 2x4s on the left. The front of the home is to the right. 5 Bedrooms, 4 Baths, Living Room / Dining Room / Library, 4000 Sq. Ft of Living Space, 1 Office, 1 Study Room, 1 Family Room. Photographed by Gene Pesek on February 9, 1981. Reporter: Jackie Thomas. Acquired from the archives of the Chicago Sun Times. Two similar views. 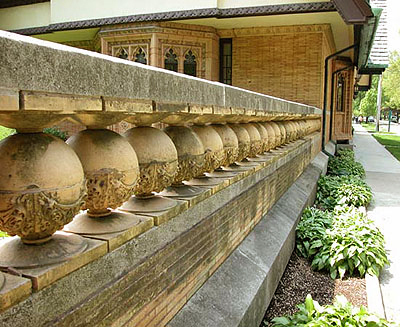 Description: "Four Landmark Frank Lloyd Wright Townhouses For Sale." 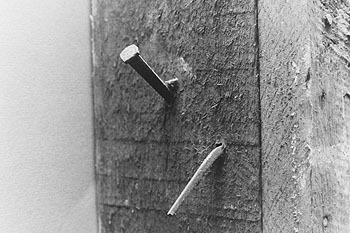 Remnants of the original hand made nails. Photographed by Gene Pesek on February 9, 1981. Reporter: Jackie Thomas. Acquired from the archives of the Chicago Sun Times. Three similar views. 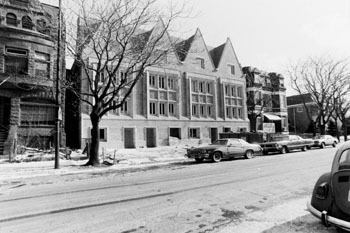 Title: Roloson Rowhouses during 1981 renovation (1894 S.026). Description: "Four Landmark Frank Lloyd Wright Townhouses For Sale." One of the four bathrooms. Douglas Elementary School can be seen through the window on the left. 5 Bedrooms, 4 Baths, Living Room / Dining Room / Library, 4000 Sq. Ft of Living Space, 1 Office, 1 Study Room, 1 Family Room. Photographed by Gene Pesek on February 9, 1981. Reporter: Jackie Thomas. Acquired from the archives of the Chicago Sun Times. Three similar views. 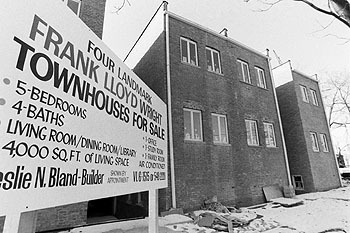 Description: "Four Landmark Frank Lloyd Wright Townhouses For Sale." 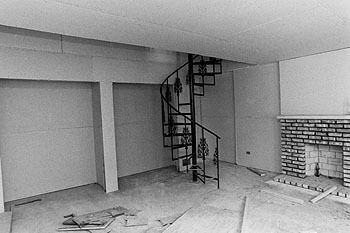 View of the third floor bedroom with a fireplace on the south wall and a spiral staircase going up to a bath and dressing room located in the peck of the fourth floor. Photographed by Gene Pesek on February 9, 1981. Reporter: Jackie Thomas. Acquired from the archives of the Chicago Sun Times. Two similar views. 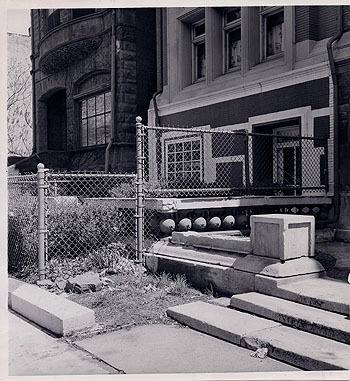 Title: Roloson Rowhouses (1894 S.026) 1986. Size: Original 10 x 8 B&W print. 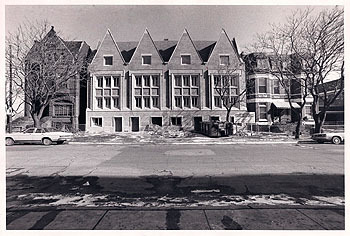 Title: Roloson Rowhouses (1894 S.026) 1987.